Over the past year, Canada’s history has been centre stage. Controversy about commemoration of the past has fuelled public discussion and debate. In addition to #Canada150, the sesquicentennial anniversary of Canadian Confederation, there were impassioned arguments over the legacy of historical figures such as Hector Langevin, Egerton Ryerson, Joseph Trutch, Nicholas Flood Davin, Mathew Baillie Begbie, Edward Cornwallis, and Sir John A. Macdonald. 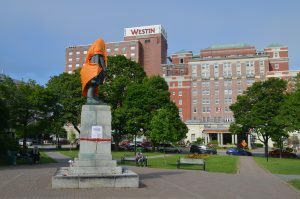 Statue of Edward Cornwallis in downtown Halifax, Photo by Ben MacLeod, Wikimedia Commons. Rather than weigh in on these specific controversies, in this essay I offer a history educator’s perspective on how we might think historically about commemoration controversies. Building upon Yale University’s Witt Committee’s “Principles of Renaming, this essay draws from Peter Seixas’ historical thinking framework to propose a series of questions designed to support teachers, students, and members of the public in making reasoned judgments about how best to respond to these controversies. Many commentators on these issues point to Yale University’s Report of the Committee to Establish Principles of Renaming as a useful set of criteria for assessing whether commemorations of historical actors and events should be revisited. The twelve-person committee chaired by history and law professor John Fabian Witt was struck after decades of protests about Calhoun College, one of twelve undergraduate residential colleges at Yale. John C. Calhoun, for whom the college was named in 1931, graduated from Yale in 1804, served as U.S. congressman for South Carolina, secretary of war, vice president, secretary of state, and senator, and was known for strongly defending slavery and white Southern interests. Is a principal legacy of the namesake fundamentally at odds with the mission of the University? Was the relevant principal legacy significantly contested in the time and place in which the namesake lived? Did the University, at the time of a naming, honor a namesake for reasons that are fundamentally at odds with the mission of the University? Does a building whose namesake has a principal legacy fundamentally at odds with the University’s mission, or which was named for reasons fundamentally at odds with the University’s mission, play a substantial role in forming community at the University? In its final report the Witt Committee explained that the decision to rename a building includes obligations to ensure that the name is not erased from history and continues to be displayed on campus markers such as museum exhibits, public art, plaques, or signs where the legacy of the individual is contextualized. They also recommended that community input and scholarly expertise is essential when considering whether to change a building name. As such, three historical advisers appointed by the President of Yale to apply the Witt Committee’s principles to the naming of Calhoun College unanimously recommended that the name should be changed. In September 2017 Calhoun College was renamed Hopper College in honour of Grace Murray Hopper, a trailblazing computer scientist, mathematician, teacher, and naval officer. Although several other American universities have employed the Witt Committee’s renaming principles to resolve controversies on their campuses, these principles cannot be directly applied to public commemoration controversies in Canada. The set of principles are unique to the context of renaming debates at historic American universities like Yale University. The Witt Committee presumed that renaming historical commemorations should be an exceptional event, where – in the Canadian context – there might be circumstances where renaming should be a necessary and commonplace event. Elliot Worsfold contends, for example, that historical figures do not have a single “principal legacy,” but rather that their legacy is shaped by multiple and often diverse perspectives, beliefs, and values within Canadian society. Despite these critiques of the Witt Committee’s renaming principles, the principles serve as an instructive starting point for developing a set of questions for helping teachers, students, and the general public think historically about commemoration controversies. Peter Seixas’s historical thinking framework has been tremendously influential over the past decade. The six historical thinking concepts that comprise the framework are central to provincial and territorial social studies and history curricula throughout Canada, numerous textbooks, books, and classroom resources include an explicit focus on the concepts. Since its inception, thousands of K-12 teachers, museum professionals, historians, and others have attended Historical Thinking Summer Institutes and professional learning opportunities. This work builds upon British, German, and American theories of history education and were conceptualized to be intelligible and communicable to teachers and students, yet generative enough to guide explorations of fundamental epistemological and ontological problems of history. The six historical thinking concepts are similar to Lee and Ashby’s notion of second order concepts in that they are procedural, focus on how to do history, and shape our understanding of the discipline as a form of knowledge. The six second order concepts included in Seixas’ framework are taught alongside first order substantive concepts such as revolution, president, and nation that centre on what history is about. Seixas suggests that the six historical thinking concepts resemble concepts, but also function as problems, tensions, or difficulties in doing history that require students to comprehend and negotiate productive solutions to present-day problems. Thus, historical thinking focuses on deepening students’ understanding of historical content, while also developing increasingly sophisticated understandings of how historical knowledge is produced. In the section below I have used Seixas’ model of historical thinking to develop a framework of questions that can be utilized by teachers, students, and the general public to think historically about commemoration controversies. Primary Source Evidence focuses on helping students make plausible inferences about the content and context of primary source traces and accounts in order to respond to historical questions and inquiries. Monuments, statues, and other structures that commemorate historical events, people, or groups have their own history distinct from the historical event, person, or group being commemorated. Sourcing: What type of commemoration is being investigated? When and where was the commemoration created? Who created the commemoration and who provided support and permission to create the commemoration? Why was the commemoration created? Contextualizing: What was happening at the time the commemoration was created? What conditions, worldviews, beliefs, and attitudes were prevalent at the time the commemoration was created? Close reading: What claims about the event, people, or groups being commemorated are being made? What symbols, artefacts, images, structures, or words are used to communicate these claims? What does the commemoration reveal about the values, beliefs, and attitudes of the people or groups who created the commemoration? Corroboration: What primary and secondary sources can be used to support or refute the interpretation of the event, person, or group being commemorated? What do other primary and secondary sources say about the event, person, or group being commemorated? What are the main points of agreement and disagreement among the different sources? Historical Significance invites students to assess of what events, people, or groups from the past are important to learn, write, and talk about. Was the event, person, or group being commemorated recognized as being important when the event occurred, or when the people or groups were alive? Did the event, person, or group being commemorated cause change and have deep consequences for many people over a long period of time? Does the event, person, or group being commemorated highlight enduring or emerging issues in history or contemporary life? What groups are the event, person, or group being commemorated historically significant to? How does the historical significance of the event, person, or group being commemorated vary from group to group? What larger historical narrative(s) is the event, person, or group being commemorated a part of? Continuity and Change invites students to examine what has changed and what has stayed the same over time. How have views and interpretations of the event, person, or group being commemorated changed or stayed the same? How have views and interpretations of the historical significance of the event, person, or group being commemorated changed and stayed the same? How have views and interpretations of the commemoration and its importance to the community it is located in stayed the same and changed? Were the changes that resulted from the event, person, or group being commemorated positive or negative? For which groups were the changes positive, and for which groups were they negative? Cause and Consequence focuses on the relationship between the actions of historical actors and the conditions and circumstances that influenced historical events. What were the intended and unintended consequences of the event, person, or group being commemorated? To what degree could the negative consequences have been anticipated and avoided or positive consequences foreseen and enhanced? Historical Perspectives focuses on helping students better understand the social, cultural, intellectual, and emotional beliefs, values, worldviews, and practices that shaped people’s lives and actions. Were the beliefs, attitudes, values, and worldviews held by the person or group being commemorated commonly held or considered normal at the time? What diverse historical perspectives existed about the event, person, or group being commemorated? The Ethical Dimension invites students to make ethical judgments about whether the actions of historical actors in the past were justified, decisions about assigning blame or credit to individuals or groups for their actions, and conclusions about what obligations those in the present owe to victims, heroes, and others who made sacrifices in the past that benefit people in the present. Controversies about what should be done about commemorations are central to the Ethical Dimension and the previous five historical thinking concepts can be seen as important building blocks for making reasoned and plausible judgments about commemorations. Were the actions taken by the person or group acceptable given the values, attitudes, and beliefs that existed in society at the time? Would the actions taken by the person or group be acceptable given the values, attitudes, and beliefs that exist in contemporary society today? To what degree was the person or group being commemorated responsible for the historical events that took place? Should the event, person, or group be commemorated and memorialized given its historical legacy? Is the event, person, or group’s historical legacy aligned with the values, beliefs, and values of the community where the commemoration is located? Does the commemoration of the event, person, or group negatively affect individuals or groups in the community where the commemoration is located? Should the commemoration of the event, person, or group be kept as is, revised, or removed? Given that each historical thinking concept includes important questions for thinking historically about commemorations, it appears that commemorations could have the potential to be a powerful topic or issue for teaching multiple historical thinking concepts and strengthening the development of students’ historical thinking. It is not expected that students and teachers will address all nineteen questions when thinking about commemorations; rather they will select the questions most relevant to their purposes and the context of the commemoration. The nineteen questions are neither definitive nor comprehensive in terms of addressing all the questions that need to be asked when assessing commemorations. I hope that colleagues will offer revisions and additional questions that will improve this framework and offer support for those who are interested in thinking historically about commemorations. Lindsay Gibson is an assistant professor of elementary education at the University of Alberta. Lee, P., & Ashby, R. (2000). Progression in historical understanding among students ages 7-14. Knowing, teaching, and learning history (pp. 199-222). New York: New York University Press. Seixas, P. (1996). Conceptualizing the growth of historical understanding. In D. R. Olson, & N. Torrance (Eds. ), The handbook of education and human development (pp. 765-783). Oxford: Blackwell Publishers. Seixas, P. (2009). A modest proposal for change in Canadian history education. Teaching History, 137, 26-30. Seixas, P., & Morton, T. (2013). The big six historical thinking concepts. Toronto: Nelson Education.